On the one hand, the two messages might seem to be very different. 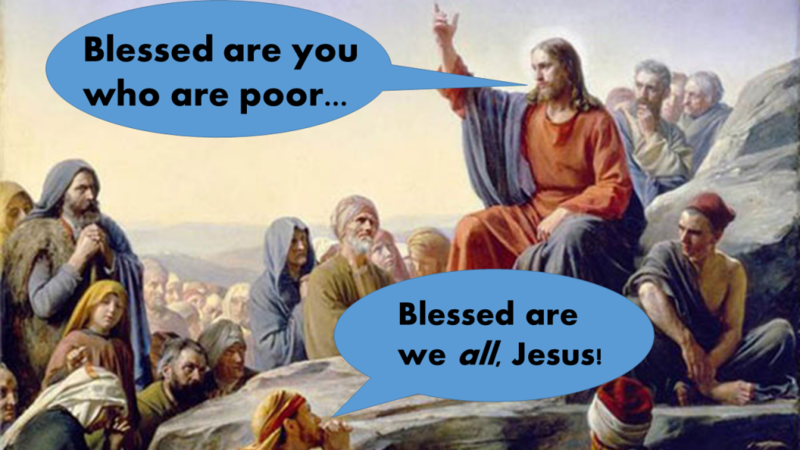 Jesus seems to actually be saying that the poor matter more than the rich, the marginal more than the powerful, the hungry more than the well fed, whereas #BlackLivesMatter has consistently meant only that black lives matter every bit as much as those of everyone else. On the other hand, the reason Jesus singles out the groups that he does for blessings (or congratulations, if you prefer) is precisely because they have been marginalized, downtrodden, and oppressed. And so there is a sense in which even a leveling of the playing field might be seen as bad news, as a reason for woes and lamentations, by those who benefit from the status quo. The thought of merely losing long-held privilege sometimes seems as though it will hurt every bit as much as actually having the situations completely reversed, as ending up oppressed rather than the oppressor. And of course, the fear at the heart of #AllLivesMatter is precisely the fear that what one has done to others will be done unto you. What do you think? If the historical figure of Jesus had lived and preached in the United States in our time, would he have addressed racism in his beatitudes? Would he have said “Blessed are you who are black…but woe to you who are white”? Liberty Counsel and the American Family Associationhave posted their Tenth Annual “Naughty and Nice” list, encouraging Christians to shop at stores that wish them a Merry Christmas rather than a mere “Happy Holidays.” Am I the only one who remembers a time, not so long ago, when Christians thought that their goal should be to bring the Christian message to those who needed to hear it, and not merely to surround themselves with other Christians to exchange Christian greetings with one another? I didn’t think so.